Perfectly located for both the business and leisure traveller just 10 mins from London Gatwick Airport. The Holiday Inn Worth Hotel is Located 6 miles from Gatwick Airport just off Jct 10 of the M23. Immediately next door to Nuffield Health Fitness & Wellbeing and close to the town of Crawley (3miles) for retail shopping and food outlets. The Holiday Inn London Gatwick Worth is a 4* AA Accredited Hotel and boasts 118 modern and stylishly decorated guestrooms. All of the rooms are complete with Flat Screen Free View TV, Working Desk, Tea/Coffee making facilities and individual temperature control. The Lytton's Bar & Brasserie at the hotel offers a contemporary dining experience with both traditional and international cuisine enhanced by our stylish setting. From a family gathering for twenty to an intimate dinner for two, the Lytton's bar and Brasserie is ideal for all types of occasions. With 300 parking spaces and only 6 miles from Gatwick Airport the hotel is the answer to expensive airport parking. We offer many Park and Fly Packages with 4, 8 or 15 day parking options. We can also accommodate for any bespoke hotel requests you may have. 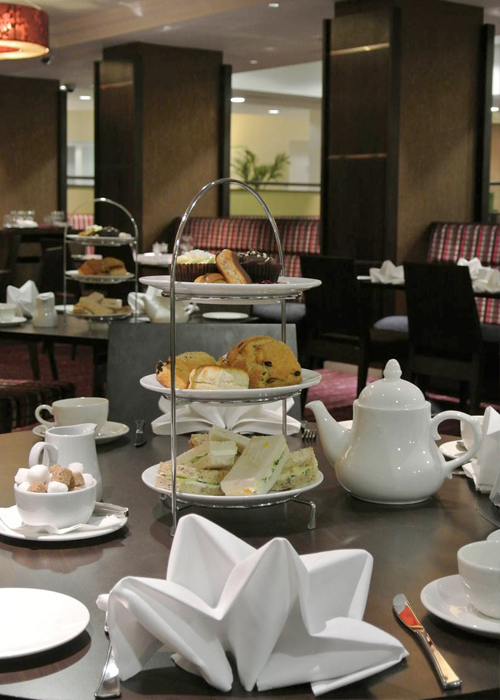 A traditional afternoon tea with scones and home-made compote at the Holiday Inn London Gatwick Worth. They also include luxurious fresh hand-cut sandwiches, cakes and sweet treats and as much tea as you please.